Joe Green sent me a couple of CDs worth of North American cicadas calling and has graciously allowed us to use them for the site. The highlight of these videos is that they feature cicada calls. I have to add descriptions, and about 50 more videos, but for now check out what’s uploaded so far. hieroglyphica 6-07 044 from Cicada Mania on Vimeo. Here’s a pleasant interruption in the 17-year cicada mania. 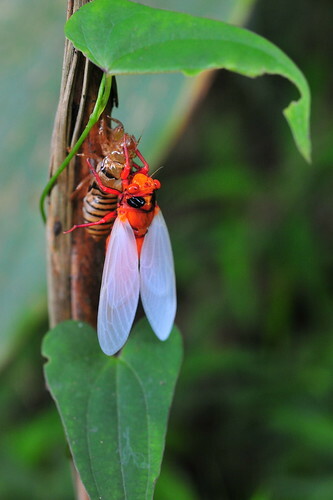 Joe Green has sent us some cicada photos from Florida. These are from last years season. Joe says the Neocicada hiroglyphica cicadas have been singing in Florida since April 29th.